Color and Lock style may vary. 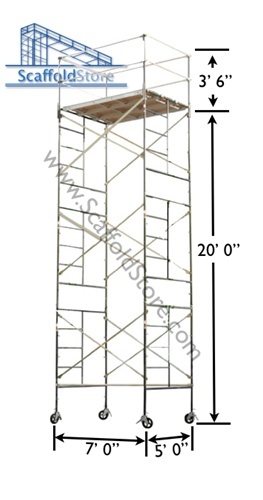 This Scaffold Tower includes: * 6 - 5'W x 6' 4"T Mason Scaffold Frames * 6 - 7' x 4' Hot-Dipped Galvanized Cross Braces * 12 - Coupling Pins * 12 - Spring Retainer Clips * 16 - Toggle Pins * 4 - 42" Guard Rail Posts * 4 - 5' Hot-Dipped Galvanized Guard Rails * 4 - 7' Hot-Dipped Galvanized Guard Rails * 3 - 7'L x 19"W Aluminum/Plywood Hook-On Decks * 4 - 8" Heavy Duty Locking Casters * 1 - 5' x 7' Horizontal / Diagonal Gooser This Package includes all necessary Safety Equipment to be OSHA compliant! All components exceed minimum OSHA & ANSI requirements! Don't forget to ask about upgrading to Socket Jacks (for adjustability and leveling) and Aluminum Decks. Please call for a Shipping Quote. Ships on a common carrier, on a pallet. The carrier will call to schedule delivery. Color of frames and style of locks may vary; because we have multiple locations, we will send you the style that is most common in your area (making it easier and convenient to find replacement and additional parts!). * DO NOT RIDE ON MOVING SCAFFOLDS! * LOCK WHEELS BEFORE CLIMBING, AND WHEN USING SCAFFOLD! * KEEP SCAFFOLD LEVEL! * DO NOT USE ITEMS, SUCH AS LADDERS, ON TOP OF SCAFFOLD (TO INCREASE REACH)! * Picture is for illustration purposes only! * If Male Guard Rail Posts are shipped, the number of Coupling Pins and Spring Clips will be reduced by 4, each! Don't forget to ask about upgrading to Socket Jacks (for adjustability and leveling) and Aluminum Decks. * DO NOT RIDE ON MOVING SCAFFOLDS! * LOCK WHEELS BEFORE CLIMBING, AND WHEN USING SCAFFOLD! * DO NOT USE ITEMS, SUCH AS LADDERS, ON TOP OF SCAFFOLD (TO INCREASE REACH)!